during the Monster Energy NASCAR Cup Series Can-Am 500 at ISM Raceway on November 11, 2018 in Phoenix, Arizona. Kyle Busch won his eighth Monster Energy NASCAR Cup Series race of 2018 on Sunday in the Can-Am 500 at Phoenix International Raceway. That tally matches Kevin Harvick for most through 35 races, heading into the Nov. 18 season-finale at Homestead-Miami Speedway. Busch joined Joey Logano as drivers advancing to the one-race championship round after winning a race in the three-race round of eight. Kevin Harvick won at Texas Motor Speedway a week ago but was stripped of the playoff benefits of the win because of an illegal spoiler. Harvick advanced on points, though, with a fifth-place finish Sunday. After a 14th-place finish, Martin Truex Jr. also advanced on points. “We’re happy about going to Miami, and I think as you run, you just want to make it lap by lap,” Harvick said. Eliminated from the playoffs at ISM Raceway were Chase Elliott and Harvick’s Stewart-Haas Racing teammates Aric Almirola, Clint Bowyer and Kurt Busch. Almirola finished fourth Sunday, but Elliott, Bowyer and Busch all were involved in on-track incidents. Bowyer retired from the race after hitting the wall on lap 133. Busch and Elliott were involved in a multi-car wreck on a lap-269 restart. Busch retired from the race, while Elliott finished 23rd. Logano also retired from the race early after an on-track incident. He was out of the race by lap 100 after hitting the wall on lap 95. The yellow flag waved 10 times over the course of the 312-lap race, with five of those cautions coming in the final 50 laps. The final 50 laps also included two red flags. 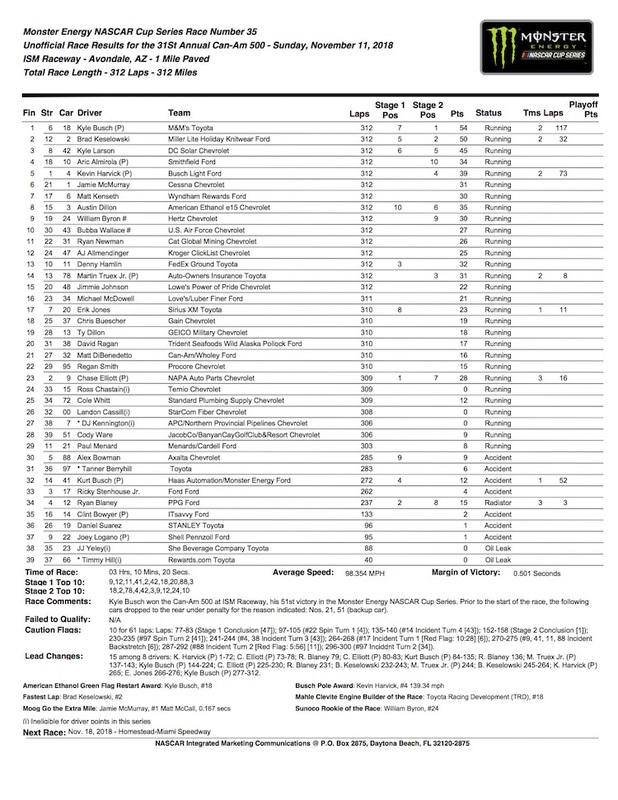 Eventual race winner, Kyle Busch, led a race-high 117 laps, but Harvick had the dominant car early. After starting on the pole, Harvick led the first 72 laps of the race before a flat tire sent him to pit road for an unscheduled stop on lap 73. Elliott inherited the lead and won the first stage that ended a couple of laps later on lap 75 as Harvick went a lap down. Harvick got back on the lead lap during Logano’s caution. After running second to Harvick through most of the opening stage, Elliott ran second to another SHR driver, Kurt Busch, early in the second stage. Busch took the lead from Elliott on the restart at the beginning of the second 75-lap stage but went a lap down right after leading because of a penalty for passing the pace car when ducking to pit road during Bowyer’s caution. Busch got back on the lead lap during a lap 228 caution. 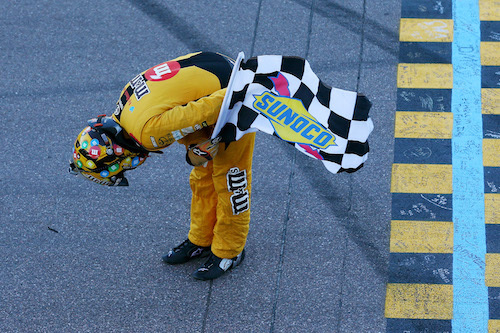 Kyle Busch took his first lead of the race on lap 144 and took a stage win a few laps later when the second stage ended on lap 150. He lost the lead to Elliott on lap 225 but took what wound up being his race-winning lead simultaneous to the wreck that took Kurt Busch and Elliott out of championship contention. Non-playoff drivers Brad Keselowski and Kyle Larson finished second and third in the Can-Am 500. Other top-10 finishers included Jamie McMurray in sixth, Matt Kenseth seventh, Austin Dillon eighth, William Byron ninth and Darrell Wallace Jr. in 10th.